For this weeks World Bird Wednesday and Nature Notes I am showing the pretty White Eyed Vireo I saw on a walk we took this past weekend. Hubby and I will take to hiking the local trails that are close by if we do not have much time. Just like my post on birding the Gunpowder River trail below, these trails are all just minutes away from our house. 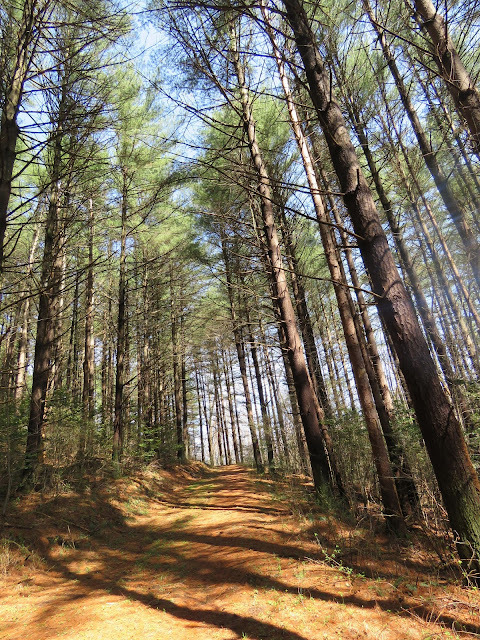 The Hemlock Gorge trail which is above the dam starts off near the road and runs along the Gunpowder River has mixed forest until you hike further back into the Hemlock forest. 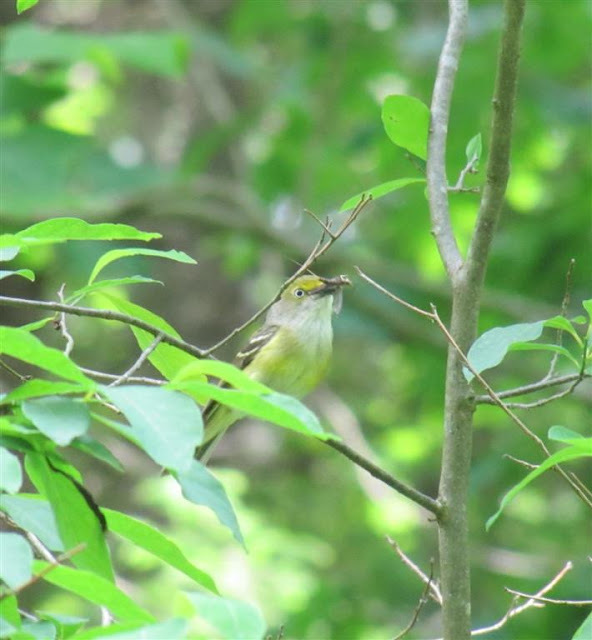 The White Eyed Vireo like deciduous forest such as stand of oaks near the water. This is exactly where we found these birds on the trail near the river. The male has yellow on its head and breast and has a heavybill. The juvies are often compared with the duller Pine Warbler. I was lucky to see three or four of these White Eyed Vireo hopping around the trees. I believe it was a family and they were in the process of foraging for their food. They did get a little fussy when we stopped to look at them. Maybe the nest was nearby? To see more great birds and photos please visit Springman's World Bird Wednesday and Michelle's Nature Notes Thanks to Springman and Michelle for hosting this memes. Thanks also for stopping by to see my post. I hope the rest of your week is wonderful. Oh what a lovely bird and to see the whole family together is FAB!!! Thanks for your comment on my dog post. They are wonderful companions. Your Goldie girl is just gorgeous and I love your photos of her! wow! that was a great catch! have never seen those birds before! Wonderful post and photos Eileen! Thats an awesome trail!! Love the White eyed--they have a very loud call that always lets me know when they are about. Lovely bird Eileen, and a great setting. I think I could happily roam there for hours. Isn't it just great to have such a good nature escape so close? I like that Viro! Super species Eileen and a great location to have on your doorstep. Hi there - that woodland down by the river looks like it could soak up hours of my time! What a great looking place. What gorgeous scenery to take in while birding! Super catch of it with food in its mouth. Have a great week Eileen! Beautiful location and nice shots of the Vireo - hard to get among the foliage! Lovely nature, wonderful shots! And you and me have very nice time, you - shooting, me - watching! Great! A very beautiful set of pictures. Well done. What a pretty bird! My favorite picture is the second one. The color looks very good, and it is tack sharp! Great hike!! Boom & Gary of the Vermilon River, Canada. Wonderful, great capture with food in mouth. I'm teelling you Eileen, you need to think about using some of your gorgeous photos for not cards or stationary. They are just so beautiful! Looks like a great place to walk ... love the bug in beak capture! I wonder if I would recognize a white-eyed vireo if I saw one! I still have so much to learn! Beautiful forest and a perfect place for a walk and to see birds. It was lovely to immerse myself in your photos enlarged. I'll just lingr a bit by that water. Great to see a wild river like the gunpowder. That must be a lovely place to walk. Excellent captures of the vireo too especially with dinner in it's beak! Hope you are having a nice and happy week! Oh Eileen, what a great catch of the White Eyed Vireo. I have never seen one before. I love your shot of the river too. Simply breathtaking scenery. And the wonderful bird photos you have here are tops. Thanks for popping by this week. Hope to see you again real soon. I love having your company. A River To Cross is my Thursday post. Very beautiful photos, especially the second one !!!! Very cool captures -- such a lovely bird! You visit so many lovely places! It's good to have nice areas for nature walks so close to home. I loved your mosaics in the last post. You always do a beautiful job with mosaics. Great photos of the White eyed Vireo~looks like a lovely place to bird! oh, beautiful photos Eileen, it's so gorgeous that you are just minutes away from the hiking trails. Hemlock gorge looks like a great place to walk. I love the shots of the birds and stream.